Declare your love of your special cat with these plaques. The plaques are made of slate that has been newly quarried in the U.S.A. and hand-cut to size. The slate is deeply carved by hand and then painted with durable exterior enamel. The slate's features and color variations give the plaque its natural beauty and unique character. 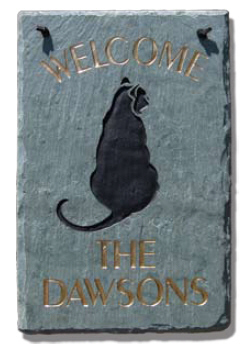 The cat plaque can be displayed indoors or outdoors. It comes with a leather strap for hanging on the wall. 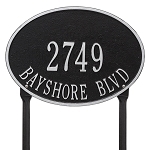 This plaque can be personalized with either one single line or two lines. The lettering is in all CAPS. The image may need to be reduced, depending upon the number of characters. 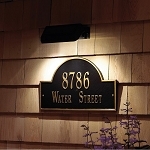 The artists will use their discretion on letter placement to make your plaque attractive. 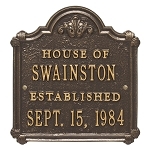 The word Welcome remains at the top of the plaque as shown.